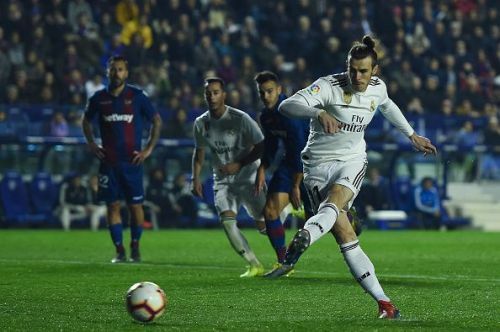 Real Madrid made up for their disappointing loss to Girona last week with a 2-1 win over Levante in LaLiga on Sunday night. The victory helped Los Blancos close the gap on league leaders, Barcelona ahead of their Copa del Rey clash on Wednesday night. The two longstanding rivals will also go head-to-head in LaLiga on Saturday. Santiago Solari's men had the Video Assistant Referee (VAR) to thank as both goals came courtesy of penalties awarded by the new technology. The first penalty came after a Luka Modric cross hit Levante's Enis Bardhi in the arms. Karim Benzema then stepped up to deliver a successful spot-kick, increasing his goal tally to 20 this season. While Roger Marti equalised in the second half, a controversial second penalty awarded to Los Blancos proved to be the decider of the game. A Cheick Doukoure clearance was deemed to be worthy of a penalty by VAR, despite many fans pointing out that there was no physical contact between Doukoure and Casemiro during the incident. Levante president Quico Catalan was quick to condemn the decision stating that the European champions did not deserve the second penalty. Los Blancos has had a number of controversial penalties in recent weeks, as a similar penalty was awarded to Vinicius Jr during the Madrid derby a few weeks ago. Just watching real Madrid game, ref gave real a pen for a blatant dive! Then went to VAR which agreed it was a penalty!!! That's why VAR is and will be in future a joke!! Disgrace! !